I bring to you . 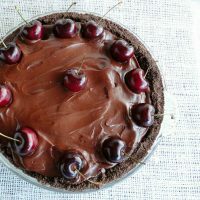 . . a rich, creamy pie that is loaded with cherries and smothered with dark chocolate ganache. 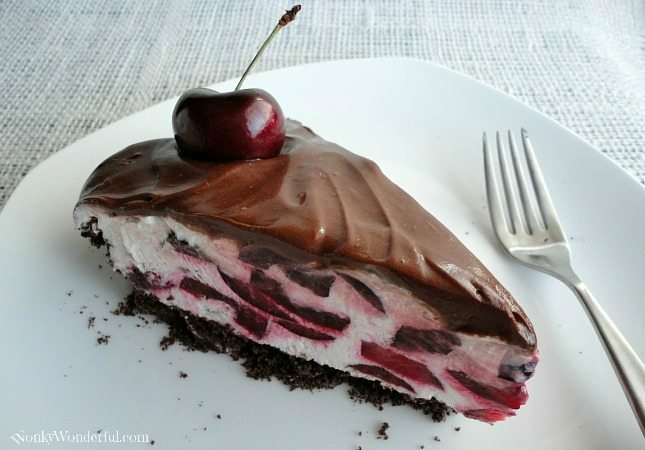 Chocolate and cherry is one of my favorite flavor combinations. I absolutely adore anything Black Forest and this pie also has a slight cheesecake flavor from the greek yogurt in the filling. This Black Forest Cream Pie is simple to make and turns out gorgeous. The end product looks fancy and is quite a show stopper. I love how the layers of the pie look once you slice into it. The dark crimson cherries surrounded by the pale creamy filling and the beautiful smooth chocolate topped with a whole ripe cherry. It will look even better if (unlike me) you can slice into a pie without mangling the pie crust! Combine the graham cracker crumbs, melted butter and sugar. Place into a 9 inch pie pan and press down keeping it as even as possible. Bake for fifteen minutes at 325 degrees. Thoroughly mix the greek yogurt and Cool Whip. Gently fold in the sliced cherries so that the cherry juice doesn’t stain the filling and turn it pink. Spoon the filling mixture into the cooled pie crust and spread into an even layer. 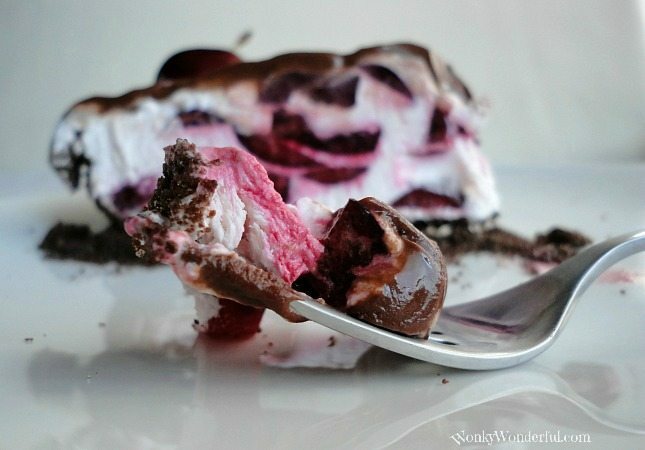 In a microwave safe container, mix the Cool Whip and dark chocolate morsels. Microwave for about one minute stopping every fifteen seconds to stir. Once the chocolate starts melting into the Cool Whip stir until they are fully combined and look like a glaze. Set the chocolate topping aside to cool and thicken for about five minutes. Then pour the chocolate over the top of the pie and spread it into an even layer. 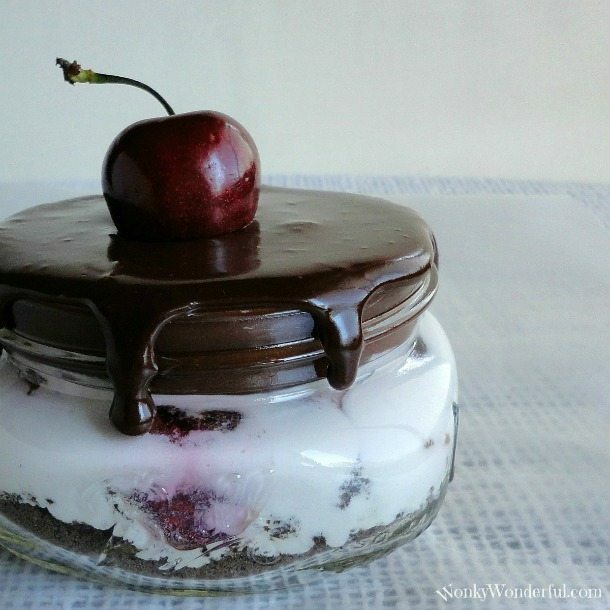 Add cherries on top and step back to admire your beautiful creation! For individual servings like in the photo below, skip the crust baking step. Crumble the graham crackers then add them to the bottom of the jar. When fresh cherries are not available I use Chobani Black Cherry Greek Yogurt. I prefer to place the pie in the freezer fifteen minutes before serving so that it is firm and easier to slice. How can I get a printable recipe? Thanks. 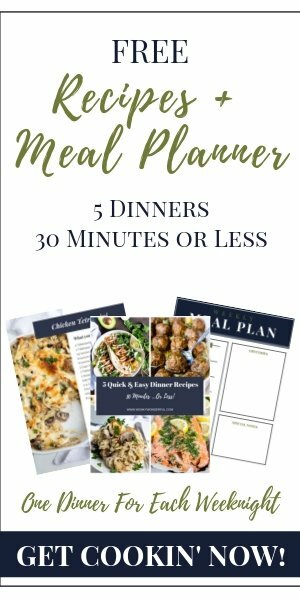 I’m in the process of creating printable versions of my recipes. I put this at the top of my list and converted it into a printable recipe for you. I hope you enjoy! This looks fantastic, but I live somewhere without cool-whip. Is is possible to substitute regular homemade whipped cream or is that too heavy? Hi! I was wondering how you sliced your cherries as they have really big seeds in them? I used a cherry pitter to first remove the seeds. The seeds can be removed just by slicing cherries in half and pulling out the pit. But, that is kind of tedious.